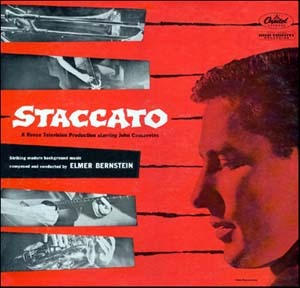 Elmer Bernstein's birthday was a couple of days ago and we'll celebrate by making his music for the great TV show Johnny Staccato the 365th Soundtrack of the Week. It was a great show, starring John Cassavetes as a private detective in Greenwich Village. Staccato had ambitions to be a jazz pianist and his hang-out was a jazz club called Waldo's, run by Eduardo Ciannelli. You'd often see great musicians playing on the show, Gerry Mulligan, Shelly Manne and so on. Many of them are on this soundtrack album also. "Staccato's Theme" uses the same rhythmic foundation as Bernstein's The Man with the Golden Arm. Everybody else copied it, so why shouldn't Elmer borrow from himself? One of my favorite tunes is the slow, sad "Night Mood". This is followed by the agressively tense and menacing "Deadly Game", the tune on the record that, with the similar "Greenwich Village Rumble", sounds most like the score from something. More West Coast-type jazz is found in "The Jazz at Waldo's". This is a decent composition, well played by great musicians, but it's the most generic and least interesting cut on the record. "Like Having Fun" sounds like it's title, a gently bubbling jazz confection. The easy-going mood continues with the next track, "One Before Closing", which is similar to "Poi and Juice". The melancholy feel of "Night Mood" suffuses "Walk a Lonely Street" before the record closes on a sprightly, cheerful, up-tempo note with "MacDougal Street Special", another West Coast jazz special. Great music for a great show. Happy birthday, Elmer Bernstein!